We got to spend some time with a pre-release unit of the just announced Samsung Galaxy Tab 7.0 Plus Honeycomb tablet and we are rushing to share our impressions with you. The compact, but powerful slate looks pretty promising and we bet many of you will be eagerly waiting for it to hit the shelves. Unfortunately, the unit we had didn’t even power on so we’d just be focusing on the hardware, but we doubt there’s much about the Honeycomb 3.2 plus TouchWiz combo that still needs explaining anyway. So here’s the deal – the Samsung Galaxy Tab 7.0 weighs about as much as the Galaxy Tab 7.7 that we revealed not too long ago. The larger screened tablet was also slimmer than the newly announced one, but that is to be expected (slimmer profile is one of the advantages of Super AMOLEDs). Unflattering comparisons to the Galaxy Tab 7.7 aside, the Galaxy Tab 7.0 Plus is a pretty sweet-looking tablet. Furthermore, Samsung is expected to make up for the lack of AMOLED and less appealing screen estate/weight ratio with a befitting price cut so this one has quite a lot of potential. The Galaxy Tab 7.0 Plus back looks pretty sleek with the brushed metal pattern, but make no mistake – it’s all plastic. That’s the only way to keep the weight (and probably the price) down, while the fact that it does well hide fingerprints comes as a welcome bonus. It doesn’t feel as nice to touch as metal, though. There are stereo speakers on the Galaxy Tab 7.0 (which is surprisingly still not quite standard with tablets) and stereo microphones too, so we can only assume that it records stereo sound for its videos. The SIM and microSD ports are on the right side of the Galaxy Tab 7.7 and both are covered with small plastic lids. There’s also a 3.5mm audio jack and the proprietary 30-pin Samsung port on this one. 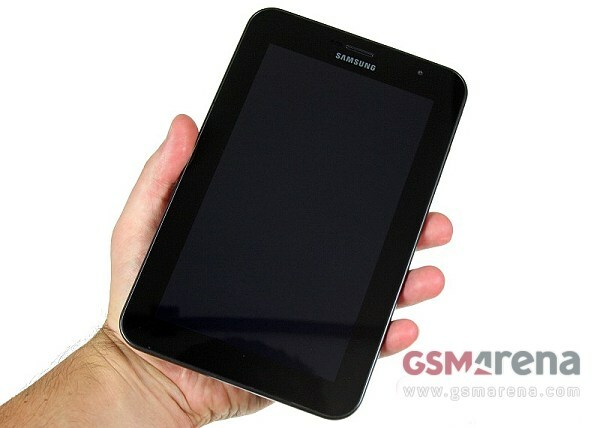 All in all, we feel quite good about the Samsung Galaxy Tab 7.0 Plus at this point. Of course, it’s way too early to draw any conclusions, but it might be the reasonably priced droid with lots of oomph under the hood that will finally let Android Honeycomb fulfill its potential. We’ll be seeing about that when we get a retail Galaxy Tab 7.0 Plus unit to play with. With the announcement coming in October those should be available quite soon.